You notice horse riders in front. What should you do first? You notice horse riders in front. What should you do first? Animals are easily frightened by moving motor vehicles. If you're approaching horses keep your speed down and watch to see if the rider has any difficulty keeping control. Always be ready to stop if necessary. You should never use your horn near horses with riders as the horse could rear up and throw the rider into the path of traffic. Horse riders are obliged to obey the rules of the road, but many riders are not necessarily aware of this, or they might be too young to understand fully. Riders will mostly choose to ride on the verge, but where there is no verge they will need to ride on the road and you will need to give them more room. Always assume that the horse hasn't seen you coming; it might have blinkers on and your vehicle will be hidden. The horse's head and the rider create a blind spot for the horse, too. Modern cars are often very quiet and it can be easy to get quite close to a horse and rider before the rider or horse realises that the car is there. Once you are passed the horse, don't use harsh, noisy acceleration as this can frighten the horse. If your vehicle has a loud stereo, turn it down before you get to the horse. If your vehicle has other noisy additions such as a sports exhaust or blow-off valve for a turbo, take extra care. Motorbikes tend to be noisier than cars and it is also more dangerous for motorbike riders if a horse is spooked and runs into their path. However, as motorbikes are narrower than cars it is easier for a motorbike rider to give a horse more of a buffer. Horses can be unpredictable, and a horse rider might not be skilled enough to control a spooked horse. On roundabouts, horse riders keep to the left within the roundabout until they reach their exit - pay attention to the rider's hand signals. 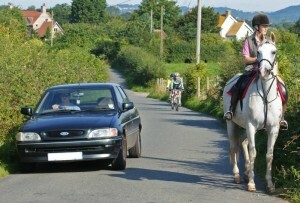 The British Horse society recommends an overtaking speed of no more than 15mph/25kph. The Highway Code rules 49 to 55 for horse riders are here.